Just started Il Ji Mae and though I have read it has a slow start, I really liked the first episode. Feels like a lot of set up, but I was intrigued by all the characters and can’t wait to see what happens! Okay – a week later, I finished it and it was really good. Lite on romance, heavy on action. Lee Joon Ki was awesome! Actually all of the cast was great! This was the first historical series I have watched and though I was very hesitant (like you don’t know how much I really didn’t want to watch the historical stuff), I really liked it. Maybe because I have watched so many relationship type series, but if was refreshing to have this be very light on romance and to just enjoy the story. All the actors were great, especially Il Ja Mae’s fathers. I also loved Ahn Kil Kang as Kong He (the monk­) he was so great, I just wanted to give him a big hug. Il Ja Mae’s mother, Kim Sung Ryung (adoptive mother) was played by the mom from You’re Beautiful and she is beautiful… seriously gorgeous even in this. Han Hyo Joo as Eun Chae was bland. I liked her in Shining Inheritance and she is also in Dong Yi, which I just started, but she was just so so in this series – she never pulled me in to root for her, I actually rooted for Bong soon more because she was more engaging in comparison. Park Shi Hoo played Shi Hoo (Il Ja Mae’s half brother) and I wish they would have developed the story between them more. I also would have liked it if they would have come together more in the end, but it was okay. Park Shi Hoo is so cute, he was the great eye candy in What Planet are You From? and I was glad to see him here, he just finished Prosecutor Princess, so I am looking forward to seeing him in that. 2. If you are looking to start a series to enjoy with a guy, he would enjoy the action. 3. 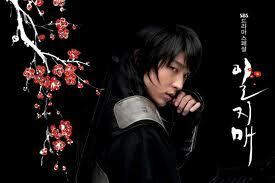 Or if you are a fan of Lee Joon Ki, he was awesome. I have conquered my hesitancy over historical dramas and I just started Dong Yi, which has been great so far, but 50 episodes, wow… I’ve never committed to such a long series but I’ll let you know if it’s worth it.